CM: Andreas Voussouras' The shadow of your smile is the development of a smaller related work, which adorned The Little Ghost House I Used to Live In, displayed at Art Athina #14. This work embodies Voussouras' desire to experiment with two photographs of unidentified women found on the market. The aspect in the photographs that attracted the artist was that each woman was caught laughing with all her guts in a remarkable way. Intending to combine images, he created a single portrait by integrating the two heads at the point of their mouth. In keeping with the artist's expectation, the resulting portrait was deformed, as an instance of monstrosity. The reaction of surprise is consistent with program, who sometimes aims for artistic experience to be so strong as to repel the viewer. Then - in keeping with Voussoura's interest of combining images with found objects - he combined the face's laughter with the jawbone from a sheep's skull. This solution implies a relationship between the osseous denture and the photographed smile revealing its teeth. It is worth noting the Christological correlation of lamb with the son of God and good man, but Voussouras' intention is known - the thinking of his work to relate to broad rather than specific explanation. 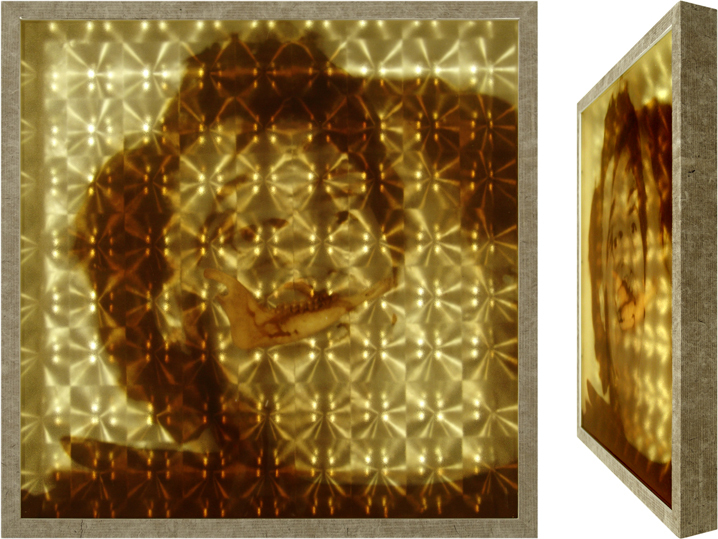 The work as a whole creates a sense of dazzling, caused by the fact of the photograph's printing onto the perspex. Even more confusion is caused by the use of adhesive membrane o n the work's background, which - with its concave mirrors - gives an illusion of depth, greater than in reality. It is worth noting that Voussouras named this project The shadow of your smile, which is the title of a melancholy 'bosa nova' song executed in 'Hollywood' style in the 1960s by the legendary singer Astrud Gilberto. For the special relationship of this work with the song (Voussouras has an ongoing relationship with music that is parallel to the visual arts) the title is of relevance in its original form in the English language and it is translated into Greek only by necessity. In this case, the use of the tender title, which implies memory, is designed to parody the confrontation of a person who laughs on the verge of deformational neurosis, with the concept of death, whose unmistakable evidence is any reference to the skull. Notwithstanding from the work's seriousness, Voussouras wanted to present a situation with no particular philosophical depth, as a joke with varying implications.